E	E	very now and again, a technological development transforms a classic sci-fi trope from science fiction into science fact. Think orbital space stations, flying cars, and tractor beams. 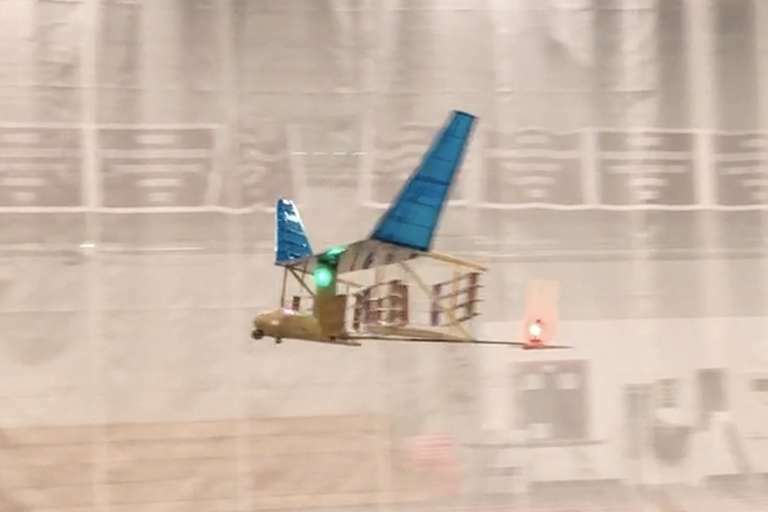 Engineers at the Massachusetts Institute of Technology added to that growing list this week with the unveiling of an ion-powered aircraft that can fly with absolutely no moving parts. Inspired in part by the technology of Star Trek, the MIT aircraft is powered by a relatively obscure principle known as ion propulsion or electroaerodynamic thrust. With ion propulsion, nanoscale particles move invisibly and silently between two sets of adjacent electrodes, generating a reaction force as per Newton's third law. Cranked up with enough voltage, the “ionic wind” system can produce enough thrust to propel a small aircraft in steady and sustained flight. According to details published this week in the journal Nature, the current MIT prototype aircraft is a lightweight glider that weighs in at about five pounds and has a five-foot wingspan. The fuselage carries a series of lithium-polymer batteries and a power converter that can generate up to 40,000 volts of electricity. The voltage is pumped into an array of thin wires that are strung along and beneath the front end of the glider wings. A similar set of thicker wires is strung along the back of the wings. Once the front wires are powered up, they attract surrounding air molecules and strip away negatively charged electrons — that's the ionization part. The remaining molecules, now ionized, are attracted to the negatively charged electrodes in the wires at the back of the wing. As the ions rush toward the wires, they sweep adjacent air molecules with them, generating thrust. That's the ionic wind, and it's essentially the same kind of force generated by a turbine or propeller. In a series of indoor tests, the MIT team was able to fly the five-pound glider in sustained 60-meter short hops multiple times. That was all the room they had to work with in the testing facility, but it's enough to generate significant hope for the basic design strategy. Near-term applications for the technology could include the development of a new class of silent drone aircraft. Down the line, the team hopes to combine ion propulsion with traditional thrust systems to create larger hybrid aircraft, potentially even cargo and passenger planes. The basic principle of ion propulsion was first discovered in the 1920s, and it's been a popular area for flight hobbyists who create ultralight model aircraft wired to a voltage source. You can often find these kinds of ionocraft projects at science fairs and aeronautic events. Barrett said that inspiration for the MIT plane came from this tradition, with a little push from the Star Trek sci-fi series. Barrett was a fan as a kid, and was particularly interested in the landing shuttles that appeared to move through space (or planetary atmosphere) with no apparent moving parts. Barrett started noodling with the concept of an ion propulsion systems about nine years ago. Going forward, Barrett's team is hoping to increase the efficiency of their design by figuring out a way to generate more thrust with less voltage. Barrett said he's also interested in finding out out whether ion propulsion could lead to a different kind of aircraft, such as fixed-wing fliers with no visible propulsion system or controls surfaces such as rudders and elevators.